Don’t let New Year requirements catch you by surprise. 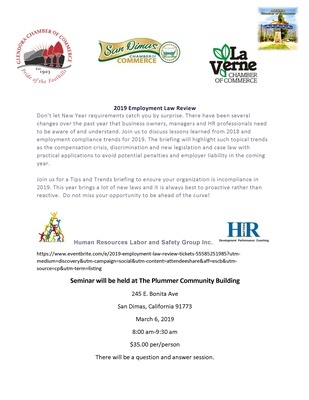 There have been several changes over the past year that business owners, managers and HR professionals need to be aware of and understand. Join us to discuss lessons learned from 2018 and employment compliance trends for 2019. The briefing will highlight such topical trends as the compensation crisis, discrimination and new legislation and case law with practical applications to avoid potential penalties and employer liability in the coming year. Join us for a Tips and Trends briefing to ensure your organization is incompliance in 2019. This year brings a lot of new laws and it is always best to proactive rather than reactive. Do not miss your opportunity to be ahead of the curve!